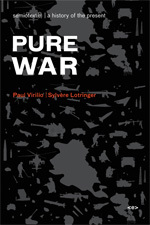 In June 2007, Paul Virilio and Sylvère Lotringer met in La Rochelle, France to reconsider the premises they had developed twenty-five years before in their frighteningly prescient classic, Pure War. Pure War described the invisible war waged by technology against humanity, and the lack of any real distinction since World War II between war and peace. Speaking with Lotringer in 1982, Virilio noted the “accidents” that inevitably arise with every technological development: from car crashes to nuclear spillage, to the extermination of space and the derealization of time wrought by instant communication. In this new and updated edition, Virilio and Lotringer consider how the omnipresent threat of the “accident”—both military and economic—has escalated. With the fall of the Soviet bloc, the balance of power between East and West based on nuclear deterrence has given way to a more diffuse multi-polar nuclear threat. Moreover, as the speed of communication has increased exponentially, “local” accidents—like the collapse of the Asian markets in the late 1980s—escalate, with the speed of contagion, into global events instantaneously. “Globalization,” Virilio argues, is the planet’s ultimate accident.